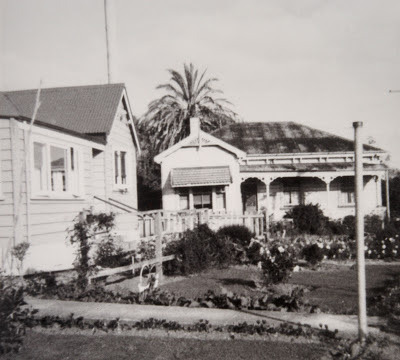 During the early goldfield days, Thamesites were born in tents, raupo huts and houses. Assistance given by women who were experienced in childbirth, before trained nurses and midwives were available. The name 'Sperry Home,' will be known to many as the birthplace of a parent or grandparent. Located on the north side of the Karaka Creek, off Bella Street, the Sperry home operated for many years in the early 1900s. Run by Midwife Mrs Isabella Smith and her mother Mrs Jane Waddell. The private maternity home provided vital maternity care before the hospital opened a specialised Annexe in 1924. Today the name lives on, the hospital café is known as 'Sperry Cafe' - in memory of the home that was located on the grounds at the back of the hospital. 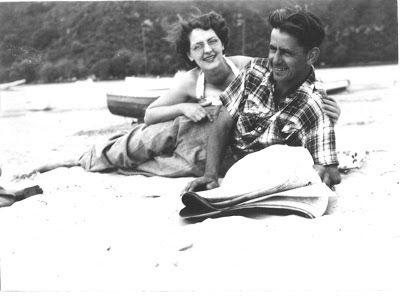 Douglas Owen Barker, was one of the babies born at Sperry Home to parents Jane and Cliff Barker on 24th August 1923. Doug died 25 years ago, on the 25th June 1988. There is nothing more disappointing to a family researcher than finding where their ancestors are buried, only to find that no sign of a headstone exists. One often asks why at least there is not a wooden cross to mark the spot. We often think of the normal decays of time being the answer. This is often the case at Shortland Cemetery, Thames - where storms have been known t destroy graves, through fallen trees and land slips. In 1943 though it appears that fire played a part in the total destruction of hundreds of graves. The fire was described as being in the south-eastern boundary of the cemetery and headed north to the top of the cemetery - in are area we today would probably call the back of the cemetery. so here could be the answer why many graves are without headstones. Regardless of the cause of headstone destruction, many remain in a poor state and thanks must go to the volunteer/s over the years who have admirably tried to keep fallen headstones semi-intact and in the right location. The Treasury at Thames is undertaking a project to photograph all remaining headstones, so that at least a photo will remain of those left standing. The weather may have deteriorated but work was well under way today, with the addition of tarpaulins on the roof to provide some shelter. From the Queen & Cochrane Street intersect, looking towards the Treasury & Archives building. Over the years several people have asked the origins of the Palms at the south end of town. The 1940s saw a need in the town to improve the image and the economic viability of the town. From the time when gold resources proved difficult to mine in the 1870s, nothing really changed over the years. What new industries can we attract, how can we make the town more attractive to investors and settlers. Reclamation was always popular along with the need to beautify the old mining town of Thames. In September 1944, the town was emerging from many of the effects of the war, some of their 'boys' were returning home from war duties and the town set about making improvements. The Thames Star 28th September 1944, stated "It has been suggested that it include the clearing of all the mangroves near the [Kauaeranga] bridge, the filling in of land and the planting of palms at intervals on the railway reserve on one side, between the trees already there." The plan was soon implemented as the 1947 photo shows below. Above you can see the trees as they are today. An often overlooked source for family memorabilia are online auction sites. It pays to have searches saved at sites to alert you to items sold relating to your main line families...especially if you can narrow the surname to the less common names. Today on Trademe is the Long Service medal belonging to ALFRED WINDER, given for five years of service on 21/12/1930. In the 1928 Electoral Rolls, there is an Alfred WINDER who is living in Pollen Street, Thames and occupation given as motor-driver. There are several other Winders' living in the Thames area. This is likely to be the Alfred Winder who with Mr Corbett ran motor services in Thames during the 1920-30s - company names include Corbett and Winder White Star Service Motors Limited. In the days before cars were readily available and bus services regular, many Thamesites travelled to Auckland via 'service car' as they were known, rather than as may be called taxi today. The Treasury's oral history collection has many examples of people using service cars belonging to proprietors such as Corbett and White. The last Queen Carnival I remember was held as a means of raising funds for the 'new' Thames High School gymnasium in the 1970s. Thames today has a SANTA Parade but memories of the parades of old remain brighter. The ones held for the Centennials will be covered in later blogs. Today the focus is on the November 1935 Queen Carnival that was held to raise money for entertaining visiting Fire Brigades. The process was there would be a Queen put forward by a business/group and often fundraising took place, the winner being the group that raised the most money. In some instances it may have also been decided on votes. 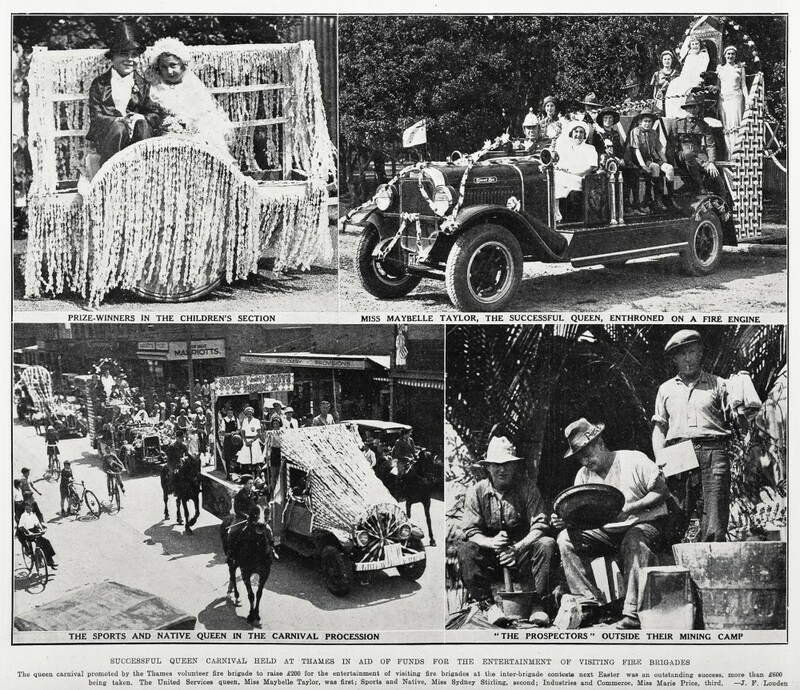 At this 1935 parade, the United Services Queen was first (Miss Maybelle Taylor), Sports and Native Queen was second (Miss Sydney Stirling) and third was the Industries and Commerce Queen (Miss Marie Price). No parade was complete without a prospectors float!